Source: Wikipedia, "Turrican II: The Final Fight," available under the CC-BY-SA License. The timedate is 3025. For decades peace, freedom, and the rule of law in galaxy Cobra 2 have been enforced by the United Planets Freedom Forces. The United Planets Ship, the Avalon 1, is drifting through the outer reaches of the known universe. Colonel Ardon C. Striker and his crew are preparing for the final passage through the barrier of the galaxy. Suddenly, a huge battlecruiser materializes in close proximity of the Avalon 1. The crew hurry to take up their battle stations amid the sounding of the alert sirens. The automated defence systems of the ship activate, the anti-radiation shields surround the ship and finally the weapon systems are armed. Somehow, with some unknown technology, the enemy battlecruiser, with a flash of blinding light, neutralizes every defence system on the Avalon 1. The sound of an explosion fills the air as an airlock of the ship disintegrates and mutants begin to pour through. The crew fight desperately to save their ship with their phasers and dozens of the invaders fall to death, but they press forward their attack and the crew of the Avalon 1 start to fall down while desperately engaging them in hand-to-hand fighting. One of the Avalon 1 soldiers, Bren McGuire, with tears in his eyes, fires the last of his phaser bolts, downing a mutant and diving to the ground as a chunk of structure falls from above. After a intense fight that wipes out all tripulants of the ship, there is silence as the evil emperor known as The Machine, half man half robot, enters the airlock and commands his mutants back to the battle cruiser. The Machine surveys the carnage, steps forward and comes to halt with one foot on the prone body of Bren McGuire. "Excellent", he says to himself, "the crew of Avalon 1 are no more". Then, without any further hesitation, he turns and leaves the ship. Bren McGuire lays still until he is certain that he is alone on the ravaged ship. Realizing that he is the only left to combat the evil of the invaders and restore peace and freedom to the galaxy, he gets up and hurries to the equipment room. There, Bren sights the new Turrican fighting suits, which are built of the most advanced technology known to mankind. Climbing into the suit, one last cry is heard from him: "Revenge!" Turrican II can be described as a cross between Metroid and Psycho-Nics Oscar. While the huge detailed labyrinth levels and the morph-ball function were inspired by Metroid, the overall graphics design and weapons were inspired by Psycho-Nics Oscar. The game is divided into five distinct "worlds" each with its own themed music provided by Chris Huelsbeck, plus a final showdown with the Boss known as "The Machine". There is a music menu accessible by pressing the Space-Bar (AMIGA version), where all the ingame music is available to be listened to. 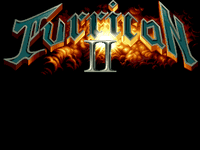 The music to Turrican II is widely regarded as one of Huelsbecks best compositions, and it was performed live by a full orchestra at the second Symphonic Game Music Concert in 2004.